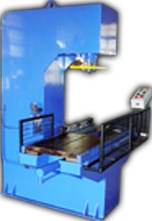 Perfect Machine Fabric - Hydraulic Press Manufacturers in India. Precision machined with hard crome tierods, moving frame precisely aligned. Gun metal bush fitted with wipers for easy sliding. Four Pillar type Presses are generally used for Blanking, Compacting, Embossing, Punching, Deep Drawing, Coining, Forming and general applications. These Presses are ideal for moulding automobile rubber components, Seals, V Belts, Flap moulding, Bakelite panels, etc. These moulding presses include compression / Transfer moulding and automatic four plate mould operating with sliding table. It has with most advance Electrical Control Panel (PLC) or these can be operated either manually or with push buttons. 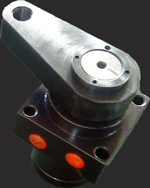 These throat type presses are compact with high operating speeds. 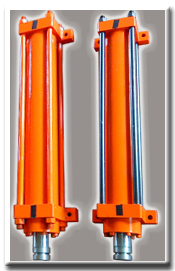 They are sturdy in design for minimum deflection of the frame. It has inbuilt Power Pack with most advance Electrical Panel (PLC) or manual operated. The Throat Type Hydraulic Press widely used in various application like Pressing, Bending, Straightening, Punching, Broaching, Reveting etc. These can be used in production or maintenance. 1) WORKSHOP TYPE press includes two forged steel table plates, heavy duty with robust design to sustain stresses. 2) Hand Pump fitted with dual speed. 3) WORKSHOP TYPE presses are multipurpose press used in general workshop and automobile workshops for straightening, Pressfitting, Bending, Forming, Punching assembling, dismantling etc. Presses can be operated either with manual hand pump or with power pack. WORKSHOP TYPE presses comes with adjustable daylights. 4)	‘V’ Blocks provided with the machine. 1. 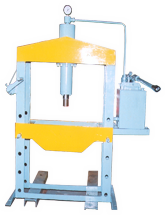 These type of presses are made out of tested materials, press frame is made out of tested ms plates, stress relieved after fabrication. 2. Scrap bailing hydraulic presses are tailored made presses as per customer requirement, based on the type of press and application, guiding arrangements are provided. 3. 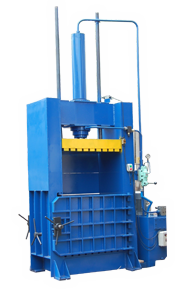 Scrap bailing hydraulic presses are generally used for Paper & Plastic scrap bailing and other general applications. 4. These can be operated either manually or with push buttons. We offer Sheet Bending Machines widely used for sheet metal purpose.